If ever there were a battery that was bound together in life and in death, it was probably pitcher Rube Waddell and catcher Osee Schrecongost. They were both born in small communities in western Pennsylvania, on opposite sides of the Allegheny National Forest, and a little less than 100 miles from each other. They both broke into the majors with the same team on the same day. For four seasons (1902 through 1905), they both served for the Philadelphia Athletics as teammates, batterymates, and roommates. They both ended their professional careers in the same year, 1910, and they both died within a little more than three months of each other – neither of them having reached the age of 40. Waddell was a star pitcher, and has been a member of the National Baseball Hall of Fame since 1946. “Schreck” – as he was typically called – was often a team’s backup catcher, both in the minor leagues and the majors, but he got in a fair amount of work and was both a good hitter and an excellent defender. Osee Freeman Schrecongost is an unusual name, though his surname was not uncommon, particularly in Pennsylvania in his day. With a brother two years older named Harry and a sister two years younger named Annie, one might wonder today where the Osee came from. There have been numerous spellings of his name, both first and last, and the spellings differ on some records of the day. He was born on April 11, 1875, in New Bethlehem, Pennsylvania, a Clarion County borough about 60 miles northeast of Pittsburgh. Two years later he was baptized in Mt. Lebanon (under 10 miles from Pittsburgh in a southwesterly direction) and is listed in the baptismal records of the Mt. Lebanon United Presbyterian Church as Osie Freeman Schreckengost. What we’re most interested in, of course, is his life in baseball. Josh Walzak, a writer for the New Bethlehem newspaper, the Leader-Vindicator, wrote a lengthy feature on Schreck in its September 8, 1999, issue. He says the family lived in Fairmount City, less than two miles from New Bethlehem, and that the young man attended school there until about the age of 10, when the family moved to an apartment on Broad Street in New Bethlehem. Osee went to work in the mines as a teenager, but played baseball too, and was a standout with the town teams of 1893 and 1894. The newspaper at the time spelled his name Ossee Schreckengost. Schrecongost had an active year in 1897 and it’s a little difficult to track just where he played and when. His record shows him playing for Augusta in the Maine State League, possibly as early as the latter part of 1896.3 He’d been on a Brockton (Massachusetts) contract, somehow, but was released to Augusta on a temporary contract on May 6.4 He was returned to Brockton and then released by Brockton on July 6.5 He next turned up with Fall River, Massachusetts, in the New England League, playing on July 10 but appearing in only four games for the Indians, hitting .353. A few weeks later the Boston Herald noted that he was now playing for the Shamokin club in the Central Pennsylvania League.6 The Coal Heavers folded, though, “owing to lack of patronage,” on September 7.7 The paper noted that Osee had received offers from both Louisville and Philadelphia. Indeed, the very next day – September 8 – he shows up catching for Louisville (presented as Sch’t in the box score). That was the day Schrecongost first played in the major leagues, debuting with the National League’s Louisville Colonels on September 8, 1897. He was 0-for-3 in the game, his only one that year. He was charged with a passed ball. Pitcher Rube Waddell made his big-league debut in the same game, Baltimore beating Louisville, 5–1. The syndicated news report from Baltimore described it as “a dull and uninteresting game.” Waddell, it was written, “pitched a good game, but worked against some very hard luck.”8 How good it was could be debatable, given the four bases on balls Rube doled out and the 11 hits he surrendered. Waddell also hit a batter. He struck out two. The Sun also reported that a Chicago paper had sent a telegram to Pulliam asking, “Is that catcher’s name on the level?” It was only one of a number Pulliam received when sports editors at various newspapers saw the full name Schrecongost. “ ‘Who will be in the points today,’ was asked of Manager Clarke before the game by the Sun reporter. ‘This man will pitch,’ he replied, pointing to the name ‘Weddel’ in the score card, and that tall fellow over there will catch. I don’t know what his name is.’ But he called to Schrecongost and got that young man to spell his name out for the newspaper man, regardless of how long it delayed the game. Some listings also show Schreck as having been with both Williamsport and the Sunbury Pirates (both of the Central Pennsylvania League) at one point or another, in addition to Shamokin. There were quite a few shifts in teams within the league that year. Once again, in a postseason (November 6) issue, Sporting Life anticipated him playing for Williamsport in 1898. Schreck played for three teams in 1898. He began the season with Cedar Rapids (Iowa) in the Western Association, but Cedar Rapids disbanded on June 9 and the whole league followed suit on the 26th. Between the two June dates, Schrecongost caught for the team in Ottumwa, Iowa. After the league folded, he played the rest of the time with the last-place Youngstown (Ohio) Puddlers in the Inter-State League. Baseball-Reference.com has him hitting .280 in 78 games for Youngstown, but the October 8 Sporting Life said he had led the team with a .310 average. He hit a couple of homers, on July 5 and September 14. As it happened, the very next day, Stanley Robison, owner of the NL franchise in Cleveland, came to look over both him and pitcher Charlie Knepper. In 1899, Schrecongost trained with Tebeau’s team in Hot Springs, Arkansas, but shuttled back and forth from Cleveland to St. Louis during the year. Tebeau continued to boost him in the springtime and it was written that even as they arrived for training, “[w]hen Tebeau introduced Schrecongost to the people at the depot he added after each hand shake: ‘Here is the little boy who is to lead our team in batting this year.’ Patsy hopes to make a change first baseman out of Schreck, and to use him in nearly every game.”14 Schreck wasn’t all that little; at 5-feet-10 he stood two inches taller than Tebeau, and at 180 (a weight he admittedly may not have yet attained) he had nearly 20 pounds on his manager. Early on, on March 28, 1899, the entire Cleveland ballclub was transferred to St. Louis after the league expelled the earlier St. Louis owners and installed a new group in its place. Schrecongost was one of 16 Spiders – including Tebeau – so assigned. It’s a story we’ll not go into here, but brothers Frank DeHaas Robison and Stanley Robison each owned shares in both ballclubs in 1899. Frank had founded the Cleveland club, and he and Stanley were part of a group that purchased the bankrupt St. Louis Browns, and then moved most of the better players to St. Louis, loading up the team they dubbed the Perfectos but leaving Cleveland with a team that finished 12th with a record (the worst in major-league history) of 20-134. In the early going, Osee appeared in six 1899 games for St. Louis without a hit. On June 5 he and Frank Bates were assigned to Cleveland. There were “Rumors of a Rumpus” between Tebeau and Ed McKean which led to the trade. In any event, once he joined the Spiders in New York, in time to get into the June 7 game, it was soon reported that “Schrecongost made an instantaneous hit here. Like Tebeau, Schreck plays ball all the time.”15 The trade came in time for him to get his photograph published in Base Ball magazine over the caption: “Ossee Schrecongost, The Rising Young Catcher of the Cleveland Club.”16 He had “fought his way into popularity here [Cleveland] by the desperately earnest manner in which he plunges into every game. He is a second Pat Tebeau in this respect, forgetting everything else when he is playing ball, but the desire to win.”17 The Cleveland club was sometimes given the nickname the Exiles in the national press, and the Washington Post called the catcher the “Ghost.”18 Schreck even beat St. Louis, winning one of those 20 games for the Exiles, with three hits – including a triple – in a 3–1 win over the Perfectos on June 25 in St. Louis. But then, on July 31, Osee was back with St. Louis, having arrived that morning. Though indeed both clubs were owned by Robisons, it was reported that “Tebeau ‘purchased’ him yesterday from President Stanley Robison of the Cleveland Club.”19 Schrecongost played the rest of the ’99 season for St. Louis, and is listed as – overall – hitting .313 in his time with Cleveland and .286 for St. Louis, with two homers but otherwise not that much power – though on August 28 he hit a double and a triple in the same game, a 14–12 loss to Washington. He played a mixture of first base and catcher, sometimes playing first when Lou Criger was catching. Schreck joined that new American League in 1901, signing on early with the Boston Americans (manager Jimmy Collins, a Buffalo-area native, knew of his work), but destined from the start to be backup catcher behind Lou Criger. On March 4 it was reported that he would break his contract with St. Louis and jump to the new league to play for Boston.22 Acknowledging that he was a hitting catcher, the April 14 Boston Journal ran a trick photograph showing two overlapping images of Schrecongost both batting and catching at the same time. In fact, he performed admirably, appearing in 86 games – ten more than Criger – and hitting for a .304 average, exceptional for a catcher in those days and well above the .278 team average. 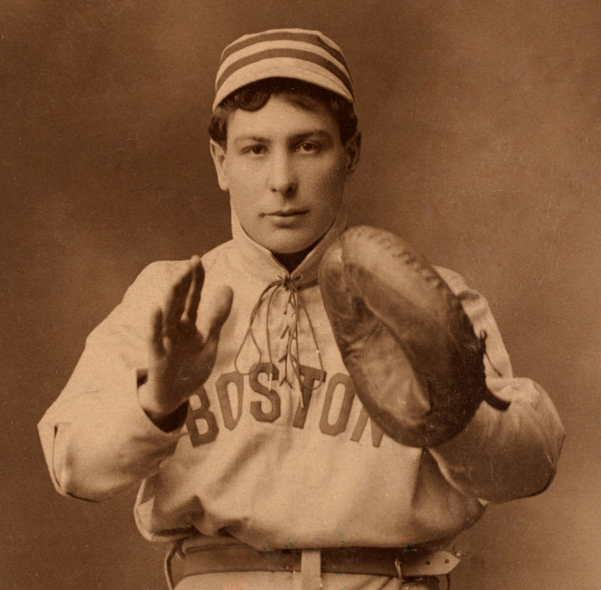 Criger was surer on defense, however, and – no small consideration – was Cy Young’s favorite catcher. Cy Young was 33-10 that year, and if he wanted a personal catcher, that was fine with manager Jimmy Collins. All three – Schreck, Criger, and Young – had been on the Perfectos in 1899, and the latter two played for St. Louis in 1900 while Schreck was in Buffalo. Charlie Hemphill was the fourth St. Louis player to jump leagues and come to Boston. Scheck did take part in the first triple play in franchise history, on August 7, 1901, at Baltimore, a 1-5-2-6-1 affair. The day before the season ended, owner Charles Somers re-signed Criger and Young for 1902, but not Schrecongost, Hemphill, or Tommy Dowd. Schreck played for Cleveland (an American League city from the start), and then the Philadelphia Athletics in 1902. Exactly why Somers didn’t want to retain Schrecongost, we don’t know, but a Boston Herald report a year later – enthusing over his 1902 season – said that Schreck had “proved a most unreliable man for Boston last season.”23 In any event, Boston traded him to Cleveland on November 16 for Candy LaChance, who became the first baseman for the Bostons for the next few years. Cleveland fully intended to use Schreck at first base, rather than as a catcher. Though he was hitting .338 for Cleveland after 18 games, playing first base exclusively, Schrecongost was released on May 13. It’s a bit of a mystery why, but as it worked out Cleveland added Charlie Hickman a few weeks later and Hickman wound up batting .378.25 Schreck signed as a free agent with the Philadelphia Athletics on May 22, and appeared in 79 games for them (71 as catcher), batting .324.26 For a catcher, who presumably had a good eye for the strike zone, he didn’t walk that much, just 102 times in 3,501 career plate appearances. His career batting average was .271 and his on-base percentage .297. Athletics manager Connie Mack had tried to get Schreck the year before, according to a few April 1901 newspaper stories.27 Now, in 1902, Mack had his man. In the first few years of building the American League, there were transactions and transitions that occurred for reasons that are opaque to us today. Philadelphia won the 1902 pennant and Waddell was 24-7, with a 2.05 ERA, both being the best marks on the club – all those victories coming in two-thirds of a season, given that he’d only arrived a little after mid-June. Waddell was a pretty good hitter, too, batting .286 in 1902. Winning the pennant didn’t take the team to the World Series. It was only the following year, in 1903, when Boston and Pittsburgh squared off in the postseason that the modern “World’s Series” began. Shreck and Rube had become roommates and began to have associations away from the Athletics, too. The two picked up a little more cash playing a pair of late September and early October games for the Camden, New Jersey, ballclub. In July Rube suddenly left the Athletics and started playing for a team of college players in Atlantic City. He said Schreck was going to join him.34 Cooler heads prevailed, and Waddell got married instead and spent Sunday, July 12, with Mr. and Mrs. Schrecongost and a volunteer fireman from Atlantic City named William Stephany.35 He threw a 2–0 shutout against the White Sox on the 14th. The year, 1904, had been a true down year, with Schreck hitting that .186, and three of the outs he made came early in the season, on May 5, when he, Waddell and the other Athletics were victims of Cy Young, who pitched a perfect game in Boston. Things turned around in 1905. Schreck hit .271, drove in 45 runs, improved his fielding percentage to .984 in 123 games, and helped roommate Waddell post a 27-10 record with an ERA of 1.48 (leading the league in wins and ERA), and helping boost the Athletics from 1904’s fifth place to the pennant. He set a record, catching 29 innings in one day, on July 4, 1905, in Boston. This year was his worst one, though, for working bases on balls. He came to the plate 429 times and walked just three times. Schreck caught the first three games of the 1905 World Series against the New York Giants, hitting .222. Waddell missed the last month of the season and the Series, and the Giants won it in five games. Alcohol played a factor in things falling apart near the end of Waddell’s season. Connie Mack was reported to have felt compelled to hire a bodyguard for Waddell “to keep the Rube straight as possible, and now the latter’s catcher, Ossie Schreckengost, has also fallen from grace.”43 He had been “breaking the temperance clause in his contract.”44 Schreck’s .222 in the Series may not seem impressive, but was second only to Topsy Hartsel’s .235 on an Athletics team that hit only .155. The Athletics scored just three runs in the five games, all in Game Two, and all the runs were unearned (Schreck scored two of them); they were shut out three times by Christy Mathewson. Despite not being present over the final weeks, save for starting in a loss on October 7, Waddell had nonetheless won 27 games, his fourth year in a row as a 20-game winner. There was discussion that winter of Rube and Schreck performing in a vaudeville show called The Battery.45 It’s not clear if the show was ever staged. Whatever other issues may have obtained, perhaps Schreck had simply passed his peak in terms of play on the field. The stats he put up in 1907 were comparable to 1906: .272 instead of .284, three fewer RBIs, one more run scored, and he improved on defense to a .985 fielding percentage, remarkably high for a catcher.48 He did suffer what at first, seemed to be a broken thumb on July 13, but it turned out to be just one which was “mashed”; he still played in 101 games. In 71 games in 1908, Schreck hit .222 for the Athletics, with only 16 RBIs. Near the end of the season, he was ready to leave Philadelphia “and had outlived his welcome with the fans of that city,” so Mr. Mack placed him on waivers.49 One wonders what else was going on with the team; an August 1 story in Sporting Life said, “[h]alf a dozen of the Athletics have shaved their heads to stall off baldness. Schreck mowed a four-inch swathe along the middle of his scalp.” There were indeed recurring notes in his last few years that made it clear Schreck had a problem with alcohol. Only one team claimed him off waivers – the White Sox. He played in six games for them at the tail end of 1908 and had three singles in 16 at-bats, suffering a true broken finger in the bottom of the eighth inning on October 2. A spitball from Big Ed Walsh was the culprit. Walsh was a 40-game winner in 1908, but lost this one to Addie Joss, who threw a perfect game. Schreck was on the losing end of another perfecto, and out for the season. It proved to be his last game in the major leagues. On January 25, 1909, Chicago’s owner Charles Comiskey traded Schreck to the Columbus Senators. He hit a far from impressive .203 in 60 games. Sold on April 19, 1910, Schreck began the season with Louisville and hit .207 in 71 games before he was traded for Emmet Reilly – sent all the way down to Class D ball, reporting on August 29 to play for the Marion Diggers in the Ohio State League. There Schreck hit .275 in 29 games, and left Organized Baseball. His arm had “gone back on him completely,” according to a June 20, 1911, story in the Washington Evening Star that had him playing with an independent team in Ford City, Pennsylvania. He also did some scouting for Connie Mack – and, along with scout Al Maul, is credited with signing Shoeless Joe Jackson to the Athletics in 1908.50 According to the story, Schreck started traveling north with Jackson to bring him to Philadelphia, but when they got as far north as Charlotte, Jackson was getting homesick and jumped off the train, hiding from Schreck. Schreck did sign to play for York in February 1913 and may have played some for teams not in Organized Baseball. It’s not clear if he ever played for York. One hundred days later, on July 9, 1914, Osee Schrecongost died “of a complication of diseases” at Northwestern General Hospital in Philadelphia – the same hospital where Doc Powers, the other main catcher on the Athletics during Schreck’s years, had died in 1909, at age 38. Schreck was 39. He had collapsed around noon the day before in a local café. His constitution had been undermined. The City of Philadelphia death certificate indicates heart disease and Bright’s disease, a kidney disease. Uremia was noted in newspaper accounts at the time. The death certificate notes that he was divorced. He is buried in Kittaning Cemetery. His mother survived him, and lived until 1927. In addition to the sources noted in this biography, the author also accessed Schrecongost’s player file from the National Baseball Hall of Fame, the Encyclopedia of Minor League Baseball, Retrosheet.org, and Baseball-Reference.com. 1 Dan O’Brien, “F. Osee Schrecongost,” in David Jones, ed., Deadball Stars of the American League (Dulles, Virginia: Potomac Books, 2006), 600. Presented in the book is Schrecongost’s signature, and that is the way he signed his name. 2 Sporting Life, December 21, 1895. 3 The Bethlehem Leader-Vindicator reports that he had gone to Augusta later in 1896, though – and more likely – Sporting Life that December had him as up-and-coming still with Williamsport. 4 Sporting Life, May 1 and May 15, 1897. 5 Boston Herald, July 8, 1897. 6 Boston Herald, August 5, 1897. 7 Philadelphia Inquirer, September 8, 1897. 8 See, for instance, the Cleveland Leader of September 9, 1897. 9 Baltimore Sun, September 9, 1897. 10 Washington Evening Star, September 10, 1897. 11 Boston Herald, May 19, 1899. 12 The quotation comes from Sporting Life, September 24, 1898. The date of the release comes from the May 7 Boston Herald. 13 Sporting Life, December 17, 1898. 14 Sporting Life, March 18, 1899. 15 Sporting Life, June 17, 1899. 16 Base Ball, July 8, 1899. 17 Sporting Life, July 15, 1899. 18 Washington Post, August 13, 1899. The “Ghost” nickname seems not to have stuck. 19 Sporting Life, August 5, 1899. 20 Cleveland Leader, August 8, 1899. Over a year later, Donlin offered a whole different take on what happened, saying the row had been in Philadelphia, between Burkett and Schreck, and resulted in those two becoming fast friends, though he did admit to punching Schreck in Pittsburgh. See Sporting Life, November 17, 1900. 21 The May 5, 1900, Boston Herald characterized Schreck’s assignment to Buffalo as having been farmed out by St. Louis, as had other papers such as the Rockford Republic of April 27. He also played eight games in the outfield and one at third base. 22 Boston Herald, March 5, 1901. 23 Boston Herald, September 29, 1902. 24 Washington Post, February 5, 1902. 25 His release was reported in the May 14 Cincinnati Post. 26 There was a moment when it appeared Schreck was going to play for Worcester instead of Philadelphia; the May 20 Cleveland Leader reported that he’d accepted terms with Worcester, but it wasn’t to be. 27 See, for instance, the Pawtucket Times and the Boston Herald of April 26, 1901. 28 Sporting Life, July 26, 1902. 29 Philadelphia Inquirer, August 29, 1904. 30 Springfield Republican, August 2, 1914. 32 Sporting Life, April 11, 1914. 33 Denver Post, May 15, 1903. 34 Cincinnati Post, July 10, 1903. 35 Philadelphia Inquirer, July 14, 1903. 36 Washington Post, August 23, 1914. 37 Norman Macht, Connie Mack and the Early Years of Baseball (Lincoln: University of Nebraska Press, 2007), 337. 38 Bethlehem Leader-Vindicator, September 8, 1999. Walzak likely got the story from the unidentified November 7, 1929, clipping found in Schrecongost’s player file at the Hall of Fame. 39 Washington Evening Star, October 13, 1903. 40 Philadelphia Inquirer, April 19, 1904. 41 Whether true or not, we are unsure, because the source of the story was reportedly Charles Dryden of the Philadelphia North American, a sportswriter frequently given to wild flights of fanciful fiction. See Sporting Life, June 4, 1904. 42 Norman Macht, Connie Mack and the Early Years of Baseball, 339. 43 Denver Post, September 25, 1905. 45 Washington Post, November 5, 1905, and Sporting Life, November 11, 1905. 46 Sporting Life, September 29, 1906. 47 Sporting Life, August 25, 1906. 48 Shrecongost had almost 200 more chances than the second-place catcher in this category. This is almost exclusively due to Philadelphia pitchers striking out almost 200 more batters than the next best pitching staff. Since it is very difficult for a catcher to make an error on a strikeout, Schreck’s outstanding fielding percentage is largely the due to his battery mates. 49 Sporting Life, October 31, 1908. 50 Sporting Life, July 25 and August 1, 1908, and the New Orleans Times-Picayune, August 18, 1912. 51 Bethlehem Leader-Vindicator, September 8, 1999. 52 Sporting Life, July 18, 1914.